We entered the room as strangers ... Parents of the children and young adults who attend Mahinawa Specialist School in Porirua. I felt nervous, scanning the unfamiliar surroundings and mentally noting all the possible sensory nasties that have been known to send my daughter, Sophia, aged seven, into an autistic meltdown in a split second. I wasn't alone. I looked around and saw a room full of parents similarly perched on the edge of our seats hoping that our child isn’t “the one” who kicks off first! I needn’t have worried. This was a concert with a difference. 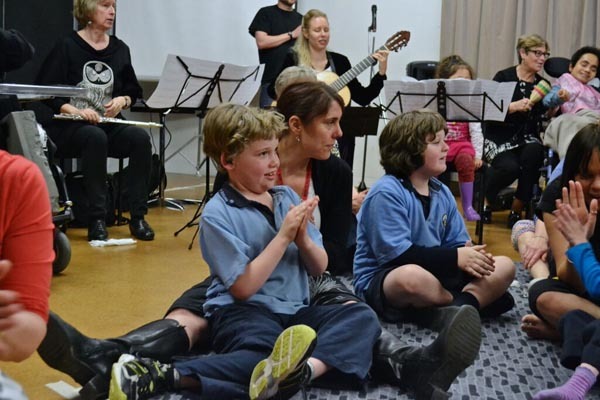 It was a “relaxed performance”, lovingly and respectfully prepared by Chamber Music New Zealand with our special kids’ unique needs in mind. The music began, filling our souls and instantly lifting our moods. As we watched our children smiling, singing and moving to the beat, all that initial worry melted away. The joy it created in the room was like a big inflatable ball floating through the air, passed from family to family. Toes were tapping, hands were clapping, eyes and smiles were beaming. Even the most still amongst us were dancing on the inside. It was a special feeling I have never forgotten, and I’m so glad I get the opportunity to relive it and share it with the world via the newly released video Connecting Through Music, produced by Arts Access Aotearoa. It documents the workshops leading up to the relaxed performance at Pataka Art + Museum late last year, and features the excellent Trio Amistad and community musician Julian Raphael. The video is subtitled and audio described for ease of access. For me personally, I left with so much more than I arrived with. I felt immense pride, gratitude and aroha – for my daughter, her classmates and their families, the Mahinawa staff, and the musicians. I felt connected – to Sophia, to her school, to our community, and to every other person in that room. Parenting a special needs child can be a very lonely experience, so it was a powerful feeling to connect and feel included. It felt like one big family. We were connected, not by DNA, but by BPM (Beats Per Minute). The steady and rhythmic musical beat connected us to each other’s lives, experiences and hearts. I could hardly wait to get home and write a blog called The Power of Music to share my positive experience with parents just like me. I will be encouraging them all to watch this video, to see the power that music can have for all of us. This experience opened my eyes to the possibilities of increased accessibility to the arts for the entire disabled community in New Zealand. 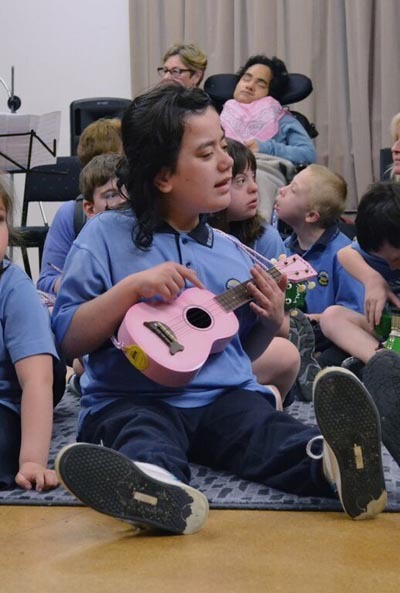 By thinking outside the box and with a bit of fine tuning, the arts can be accessible to everyone, no matter what you age or level of impairment is. Sing. Move. Clap. Tap. Feel. Connect however you choose! Original generation time 1.3524 seconds. Cache Loaded in: 0.0005 seconds.